It all started at the H.I.M. marriage conference in 2011, when Sonny Vu and his wife Christy were introduced to us. In the years since, their journey has taken them back to their homeland of Vietnam and our knowledge of them has grown only through third party mention. The “third parties” began to mention that the Vus would be interested in bringing us to Vietnam for a marriage conference if we were game, and, in the words of Brian Reagan, “. . . and one thing led to another . . .” and on June 27, we were on our way to Vietnam! Would we be interested?? YES!! For so many reasons . . . most compelling of which was Sonny and Christy’s commentary that nothing as such exists in Vietnam and as such is desperately needed. What a great opportunity to bring the hope of the gospel to an “unreached for Christ-like marriages” culture! Not far behind that "most compelling reason” was the reality that Vietnam has held a deep place in my heart since I was 11 years old, when my US Naval Officer father spent a year in Da Nang, where the first US land troops arrived to join the Vietnamese who were fighting for democracy. He spent 12 long months in Da Nang 1966-1967, and then returned with his destroyer in 1968 and spent 7 months in the waters off Da Nang. 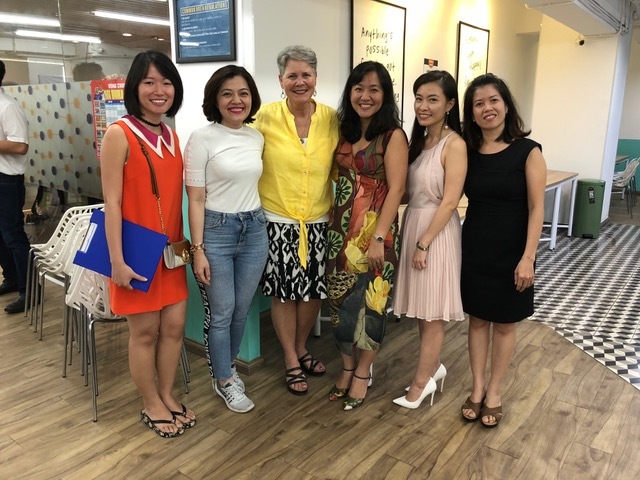 Vietnam was then sewn into the fabric of our family life and until we were invited to speak there, I hadn’t realized how much Vietnam had impacted me. After over 24 hours of travel, we landed in Ho Chi Minh City (formerly Saigon) late Thursday night, June 28th, and the adventure began. After spending the first day acclimating and settling in (and finding a geocache with Doug and Julie Macrae), we spent Saturday morning speaking to an eclectic secular group of about 80 on God’s design for marriage—without talking directly about God. Though most of the attendees spoke English as a second or third language, simultaneous translation was used by at least two thirds of the attendees. It was definitely out of our comfort zone, but backed by a great team of prayers warriors in the US, we trusted that God would work in a way only He can. We are always amazed when we speak internationally by how universal marriage, relationship, and parenting issues are! As we spoke on expectations, communication, temperaments, and sacrificial love, the attendees were thoroughly engaged and responsive. Advised to not quote scripture directly nor deliver an expressively gospel-centered message, we were able to weave the gospel in, placing it in the context of a “Christian worldview.” Afterwards, we had many conversations with people who said things like, "We’ve never heard this before!” Or, “You described my husband and me exactly!” Or, “This makes so much sense!” They seemed genuinely interested and inspired. They bought all the books we brought within minutes of the first break, expressing to us the hunger they have for truth and instruction. It was SO encouraging. First thing Saturday morning, we’re off to the conference. Sonny and Christy introduce us . . .
. . . and Paul, Doug, and Julie listen through simultaneous translation headphones. The audience was very engaged. Doug and Julie gave their “Keeping your marriage alive” skit and presentation and did a great job. They, too, were well-received. At the conclusion of the 4-hour marriage conference, we felt such gratitude for having been met by God in such profound ways. The Macraes do their skit, inspiring being intentional about keeping your marriage alive. 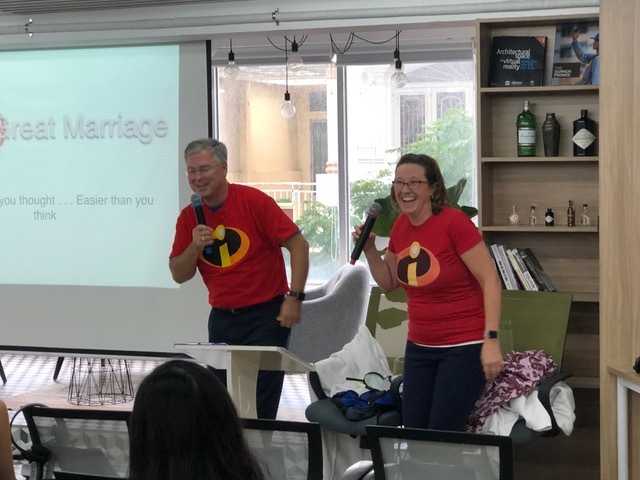 After a quick lunch at MacDonalds—Vietnam-style—we spent the afternoon with about 25 singles who came to hear a seminar on developing healthy relationships in preparation for marriage. 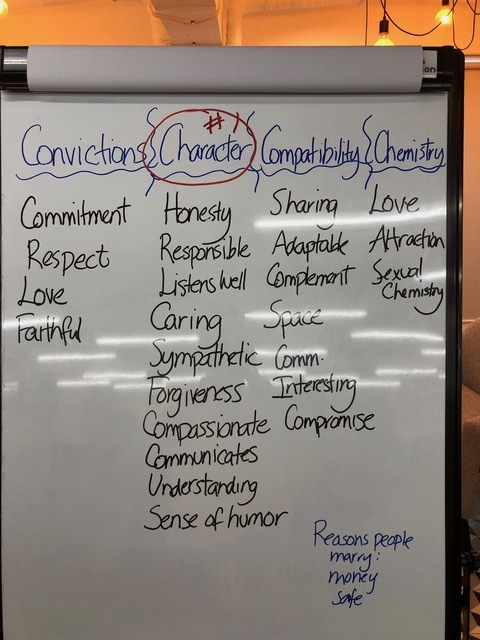 We launched the session by asking them to identify the qualities in a person that would make him/her a suitable lifelong partner and then categorized them under the “Four C’s”—Convictions, Character, Compatibility, and Chemistry. Again, we were interested to note that their list was very similar to lists we’ve compiled in Lebanon and Africa, as well as America, further confirmation that all humanity is linked at the deepest level as Image-bearers of Almighty God. The list of qualities suggested by the audience. We had lively interaction over submitted questions towards the end of the 3.5 hour seminar, about the role of faith, extended family, and the viability of marriage (“Does a piece of paper—the marriage license—really matter?”) After we were done speaking, many conversations happened and people just kept hanging around. Though quite tired by this point, we were very energized by the interest and vibe of the people. Such big answers to prayer. We returned to the hotel convinced that God had done a great work among us. Some of the single ladies who hung out for a long time after our afternoon seminar. The team at day’s end . . . very thankful. The next three days we were booked for hour-long counseling sessions. Wondering if a single one-hour session with a couple would be of any real benefit, we were once again reminded by each couple we met with that they have access to nothing in terms of marriage counseling, convincing us that one hour was better than nothing. They definitely seemed to feel that way. Again, we really felt met by God and felt there were some breakthroughs in some of the sessions. We met for counseling in this co-working space. 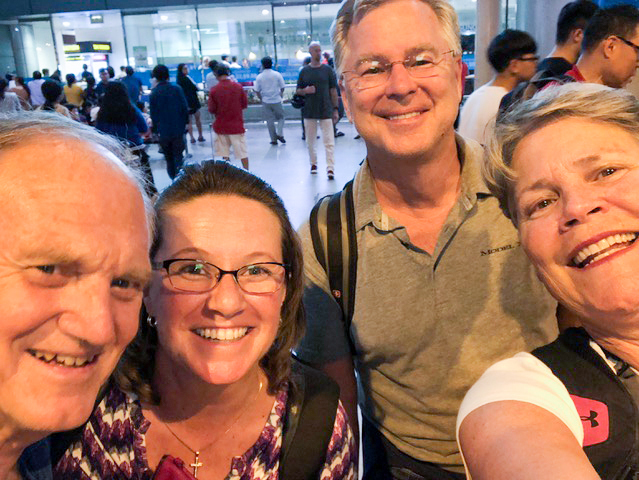 Our very generous and kind hosts then arranged for us to fly to Da Nang for a couple of days of R & R before our final two days of ministry, and what a treat that was. 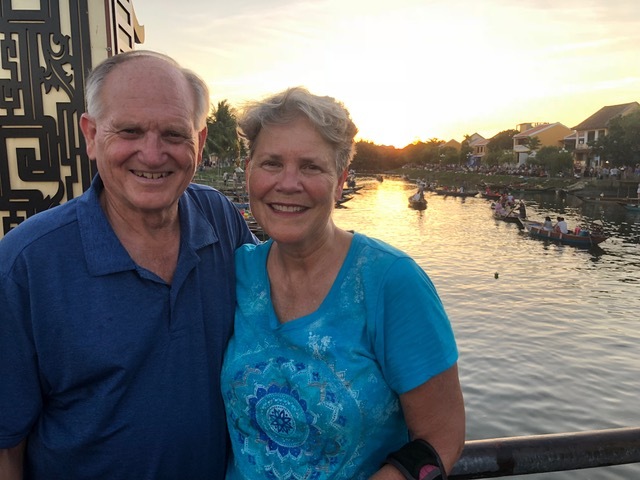 Our two full days in Da Nang—a household word in our home over 50 years ago—was like a dream-I-never-really-had come true. 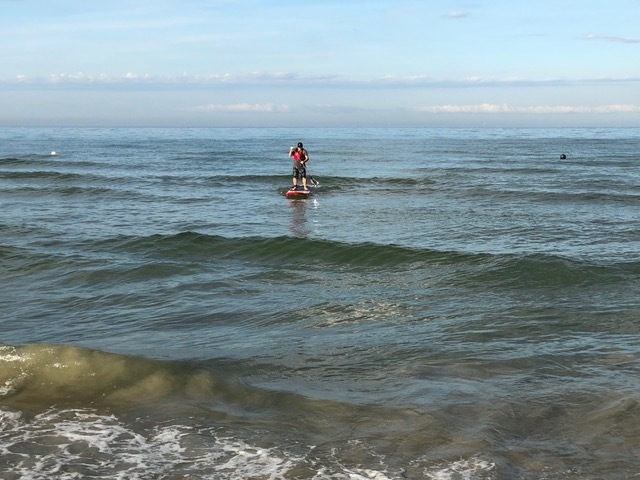 Though I knew the Da Nang we were experiencing was vastly different than the Da Nang my father knew, the geography, climate, and people were constant and I took it all in. We drove past the US military base. By the hangars for the US planes. 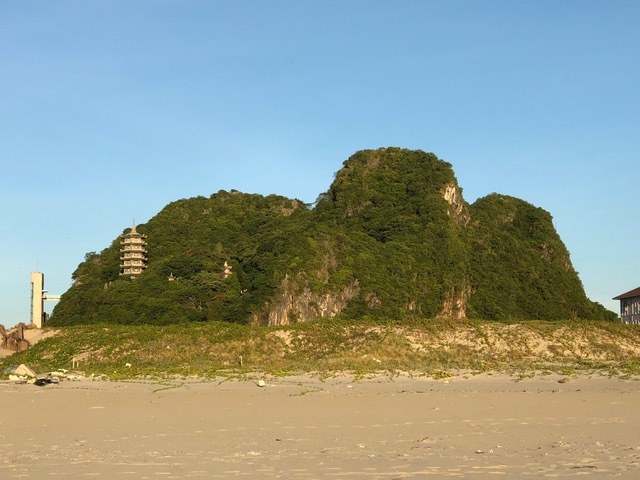 We explored Monkey Mountain, named by the US servicemen because of its large population of monkeys, and we walked on China Beach, also named by American soldiers. We stood by the radio transmitting station built by American troops on top of Monkey Mountain, which enabled telecommunications during the war. A photo of China Beach about the time my Dad would’ve walked its sand. And we saw monkeys. A little known fact of my life is that my father hand-carried a little “old world” macaque monkey home from Singapore when he captained the John A Bole destroyer a year after his land duty in Da Nang. It had been a lifelong (12 years at that point!) dream of mine to have a monkey, and after visiting Monkey Mountain myself, it was clear to me that the inspiration for bringing us “Chiko” came from my dad’s visits to Monkey Mountain. I can’t put in words how significant it was to me to be looking in the face of little monkeys that were clear relatives of our beloved “Chiko.” Such deep memories were stirred throughout our days in Da Nang. Our tour guide had some great photos from the 60’s on his iPad . . .
Hangar for US military planes during the war. On top of Monkey Mountain, where the US military built transmitting towers during the war. We also hiked Marble Mountain, did a bit of shopping at Han Market, spent half a day poking around the darling town of HoiAn (somehow untouched by war). HoiAn is where my father all those years ago bought a bolt of raw silk; my mother dyed it red and used it to sew matching Christmas dresses for us one year! Paul and I also walked China Beach endlessly (I hit 30K steps on my Fitbit one day!). Every step was a gift. Marble Mountain has many caves and temples. The largest cave housed Viet Cong during the war. From the top of Marble Mountain . . .
Han Market . 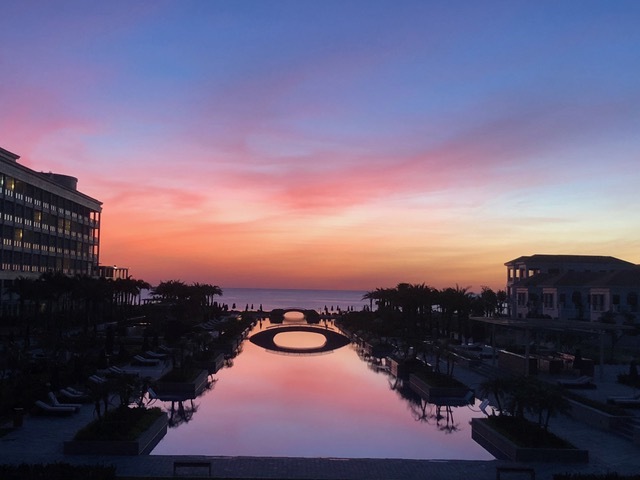 . .
We did manage to get some R & R as well, when we made the decision to stay at the resort, by the pool and on the beach, the second day after our early (5 am) visit to Monkey Mountain. Raw silk worms are being grown as part of the processing of raw silk in HoiAn. Sunset in HoiAn . . . captivating. We flew back to Ho Chi Minh City early Saturday (July 7th) and spent the balance of the day counseling. The evening was delightfully spent with Sonny and Christy over dinner and a casual debrief of our time in Vietnam. Plans were also discussed for a return visit as they dreamed about how to scale the conferences on our return. Our hearts have grown so deep for the Vus. Dinner with Sonny and Christy the night before we flew home. They made our time so extra special. 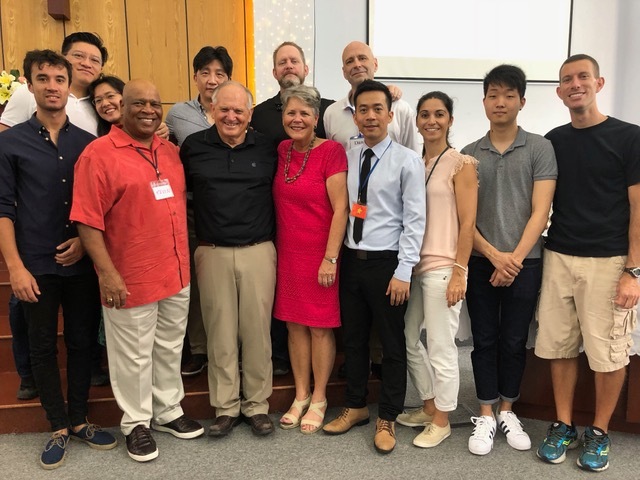 It was a privilege to fill the pulpit Sunday at the International Church, where we spoke to a congregation of about 150, representing about 27 countries. The congregation was friendly and receptive. We met a couple from the Congo, a man from New Orleans, a couple from Oklahoma City, a family from Australia, a couple from Norway, and a single guy from Germany. The church has an elder board of five men who rotate filling the pulpit and they seemed especially appreciative of our speaking. I was so struck by the truth that this mix of people from many tribes and many nations were unified by only one thing: a common faith pursuit of the Living God. Nothing else could bring such a group together!! Such a great affirmation of the reality of the gospel: our faith transcends our differences. Wherever we are in the world, the Body of Christ can be counted on to provide fellowship and community. All praise is His!! A small group of about 15 from the church took Sonny and Christy up on their invitation to a “fireside chat” in their home from 2-4 that afternoon. It was a free-flowing question and answer session, focusing on relationships, and that was a highlight of our time. There were actually 3 single guys who came, all seeking advice on how to make the right marriage choice. We loved their concern for getting it right. Part of the small group that convened at Sonny and Christy’s home Sunday afternoon. We spent the balance of the evening with Sonny (Christy left about 5 pm on a business trip) and before we knew it, we were back at the airport heading home. What an amazing experience we had. We’re still trying to get our heads around all the sights, sounds, interactions, feelings, and the overall impact of our time. It was the first time we’ve ministered in an area that has been largely closed off to the gospel since the mid-70’s. I was most deeply moved to see the hunger in peoples’ eyes and souls and was reminded that we were made for Him and our souls will be restless until they find their rest in Him. 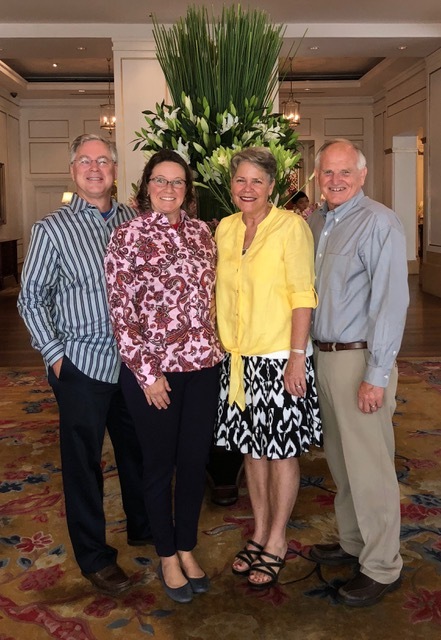 We are so grateful for the incredible way Sonny and Christy took care of us: from Business Class flights to top-rated hotels and meals, they were committed to this trip being a blessing to us as well as to them. As a result, we returned tired but not exhausted, and truly feeling refreshed in many ways. We landed Monday night, July 9, and in a very Friesen-esque way, we drove in to Boston Tuesday morning early to speak for Liberty Mutual’s philanthropy’s team, who were having their annual retreat. We were invited to give an hour and a half presentation on the Myers-Briggs Type Indicator as a team-building exercise and thankfully, it went really well. 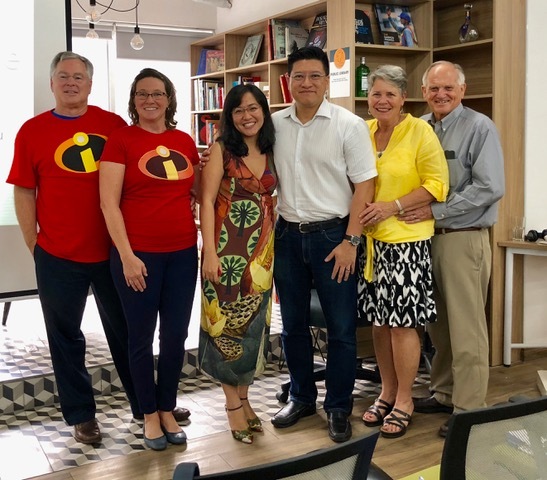 We loved interacting with this team headed by our long time friend Melissa MacDonnell and were so thankful that after years of being invited, we were finally able to say yes. The rest of our 5 days at home were filled with counseling, connecting with friends, and packing for the three-week trip that commenced this morning. We’re off to California to speak at a couple of family camps and to spend a few days with my mom. We’re so thankful for good health and great opportunities. And so Vietnam is in our rear view mirror and thankfully also in our windshield. Behind and before. Blessed.